What are the ingredients for a great party? Plenty of good food and drinks? Music that sets the right mood? A setting that makes the guests feel welcome and happy? Definitely! However, it takes a great host to bring all of these elements together. And when the party is as big and fabulous as Sundance, it literally takes hundreds of hosts to make it all happen. Sundance is a two-day fundraising party hosted by CAMP Rehoboth each Labor Day Weekend to celebrate family and raise funds for the work done all year long. It started as an anniversary party for Murray Archibald and Steve Elkins, and this year is in memory of Steve, who passed away from lymphoma in March. Sundance 2018—Rainbow XXXI: In The Name of Love returns to the RB Convention Center. Though it starts with the artistic vision of Sundance co-founder Murray Archibald, it relies on the efforts of a talented band of long-time volunteers who cut, glue, sew, fabricate, climb ladders, and otherwise do the impossible to turn the convention center into a chic and shiny urban club. The first night of Sundance features a huge silent auction. Typically, 450 to 600 items are donated by generous individuals and businesses for guests to admire and bid on, in the hope of taking some of them home. As soon as the silent auction closes, a live auction begins. Handsome auctioneer Lorne Crawford tempts the crowd with up to 20 items, including exotic trips, exquisite pieces of jewelry, and highly collectible pieces of art. And while folks are bidding, there’s delicious food, paired with beverages from the open bars. The second night of Sundance is all about dancing! 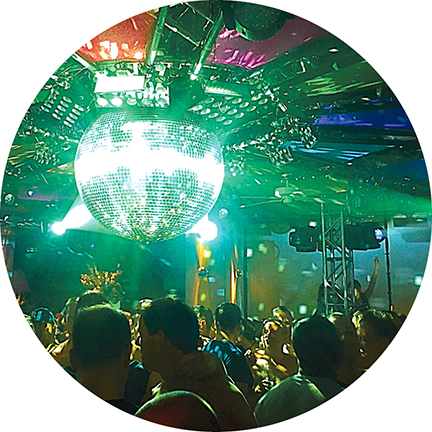 New this year, the evening kicks off early (7 to 9-ish) with the Sundance Disco Twilight Tea featuring DJ legend Robbie Leslie. Best known for his work at Studio 54 and The Saint in NYC, Robbie will spin the first few hours until international Headliner DJ/Remixer Joe Gauthreaux takes over the booth to lift the room into his signature club sound, with dancing going until 2 a.m. Whether you want an early tea dance of retro sound, or a late night contemporary club, or both, one ticket equals two dances…and one great night brought to you by hundreds of hosts. Come join us for the party, or better still, become a host! Sundance Hosts (including Supporters and Sponsors) are critical from the very beginning, long before any auctions or dancing takes place. Hosts—at all levels—come onboard now to underwrite the whole event. Hosts make the party happen. Becoming a Sundance Host, Supporter, or Sponsor signals your belief in the mission of CAMP Rehoboth and the work it does. Of course, it also gives you a ticket to the Auction Night and a ticket to the Dance Night (plus a Sundance 2018 t-shirt only available to hosts). Whether you can attend or not, your name goes on the promotional materials. And you are part of the family. You can do all of this for as little as $100 (Individual Host), $200 (Couple) or $300 (Gold Host). Since ticket prices and host amounts have remained so low for so many years, each year more and more hosts upgrade to higher levels of giving to become Supporters and Sponsorships with more substantial donations in support of the work of CAMP Rehoboth. We couldn’t do any of our work without this support. And as hosts, you permit 100% of the money from ticket sales and auction items to go to programs and support the work CAMP Rehoboth does everyday. Step up and step out as a Sundance Host today! Glen Pruitt, CAMP Rehoboth Board Member, currently does quality assurance work for non-profit organizations and government agencies.